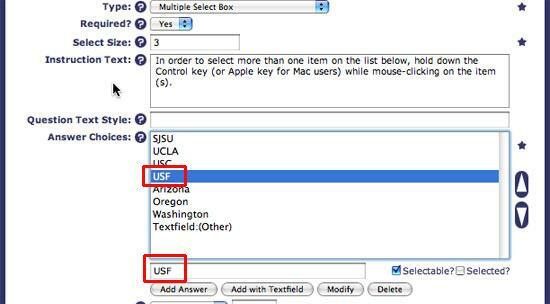 Once you have created your Multiple Select Box question, you can now add, as well as modify, delete and re-order the answer choices associated with it. You will see an option for Selectable? (To the bottom right in the above image). This allows you to set a an answer choice as either selectable or unselectable. For example, when the user takes the survey, if they choose an answer choice that is not marked Selectable, they will then be required to switch their answer choice to one that is enabled as Selectable. 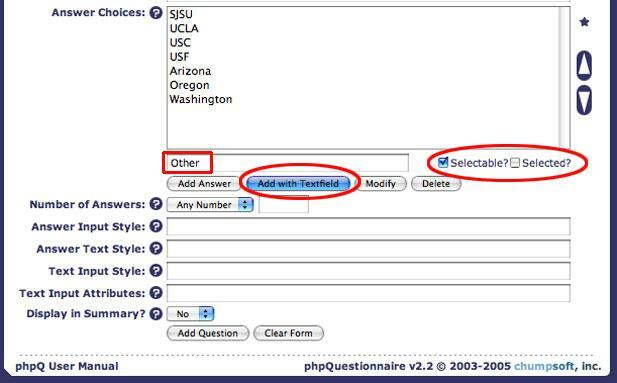 The field Number of Answers (in the bottom portion of the image below) is present in the Add/Modify a Question interface. Since the check box question allows the user submitting the survey to select multiple answers, this field allows you to control exactly how many answers the user can make. Any Number: Selecting this value, which is also the default, will allow the user completing the survey to select as many or as few responses as they wish. 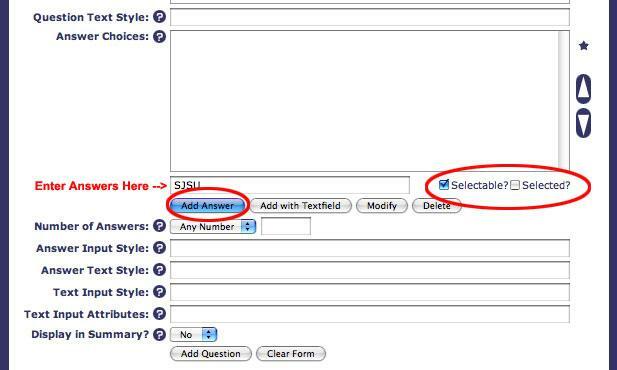 Exactly: When this is selected and an integer supplied in the field to the right, the user will be required to fill in exactly that number of answers before they can proceed to the next survey page or submit the survey. At Least: When this option is selected and an integer supplied in the field to the right, the user will be required to fill in at least that many answers to proceed. They will also be allowed to fill in more than that number. At Most: When this option is selected and an integer supplied in the field to the right, the user will be required to fill in at most that many answers to proceed. They can also fill in fewer. When you are finished modifying your answer choices, click the Modify Question to save your changes.